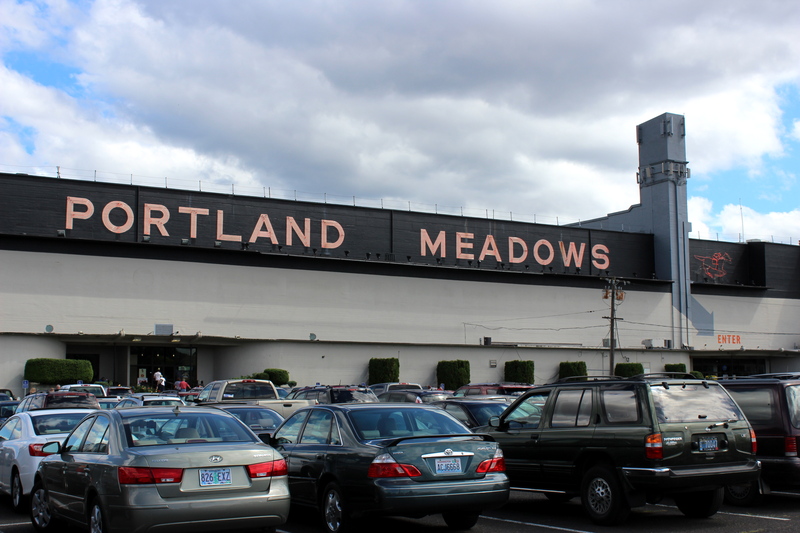 Portland Meadows has finally figured it out. 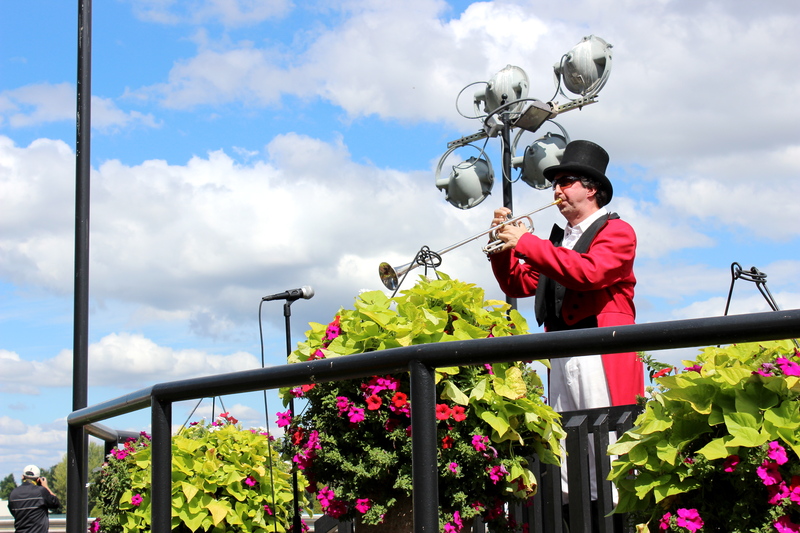 They’re brought the fun of live horse racing to the people, moving their season to the summer, with live racing every Sunday. Plus, they rebranded with a beautiful vintage logo that really classes the place up. I’ve been to the track a couple times before for the Kentucky Derby, which is a LOT of fun, but it was great to visit for a “regular” race day. 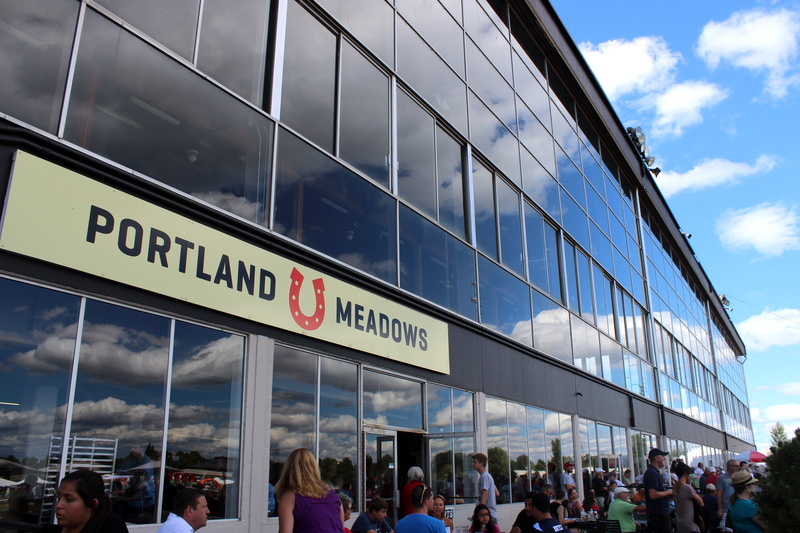 I stopped by for the “Portland Mile” race on Labor Day. It was a lot of fun, but I was surprised to see that that place was crawling with kids. I figured the race track would be closed to minors but I was totally wrong, they even had a whole kids play area set up in the middle of the track. 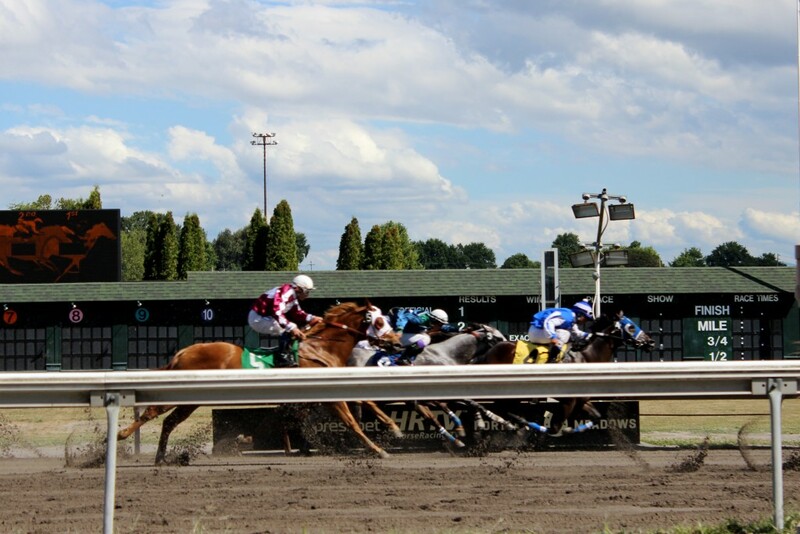 Horse racing is fun for the entire family! The first thing to do when you arrive is buy a racing program. 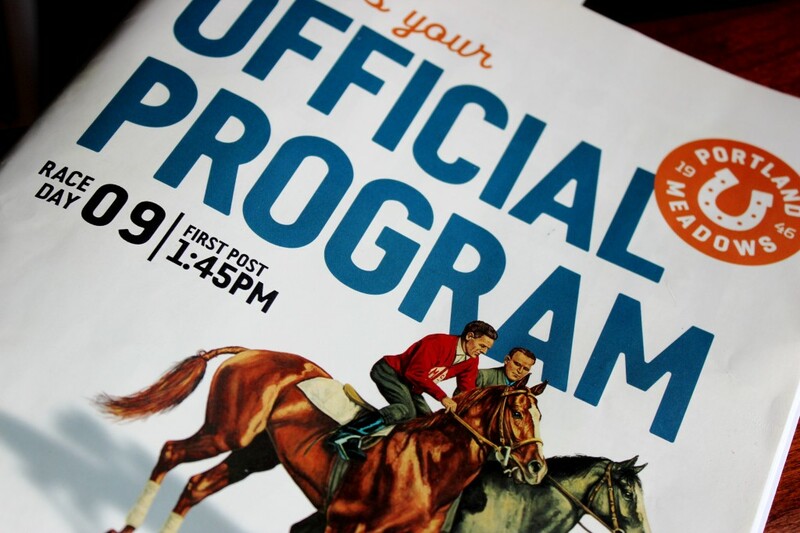 It costs $3.50 and has everything you need to know about the day’s races: the horses, the jockeys, records, post time, and a description of the race. It’s pretty complicated to read, but there is a guide at the front to help you decifer all the numbers. I like to keep my bets pretty simple so I usually place a “win” or “show” bet. 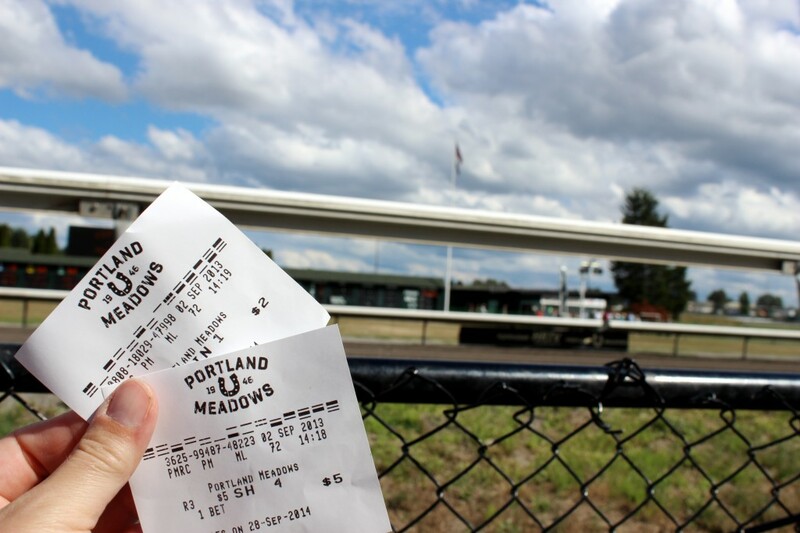 A “win” bet is just what it sounds like, you pick the horse that will come in first. With “show” you’re betting they’ll come in first, second or third. 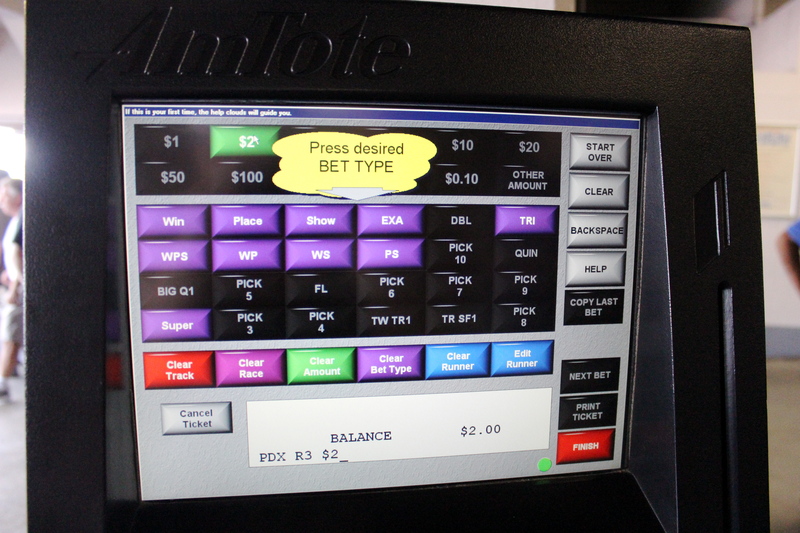 Placing a bet is really easy with computers all over the building. Simply enter your cash, and follow the prompts on the screen. I bet a $2 win bet on a horse called “Yin Your Eyes” and a $5 show bet on Blue Society, neither of them payed off. Oh well. Of course, there are tons of food and drink options. Outside the building, people push carts around selling beer, inside is a big bar serving cocktails. Beer is also available at concessions stands along with the usual sporting event fare: pretzels, hot dogs, popcorn, nachos. On the second floor is stadium seating, with tables and tv screens. I think you need to get there early for one of these prime spots. People tend to camp out all day. 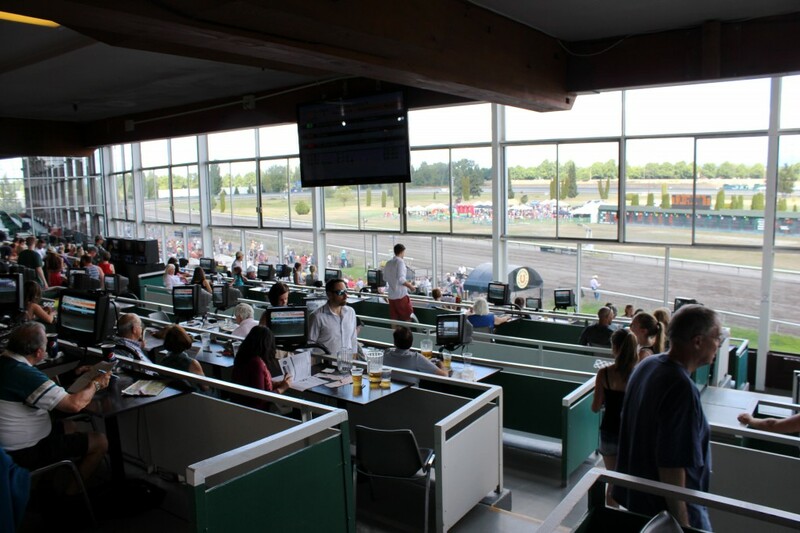 On the third level, is the Turf Club where they were serving a fancy buffet. I don’t know if they do this every week of not, but 10 minutes before each race the trupeter played at the finish line. It’s pretty cool and prompts everyone to place their bets and find a spot to watch the race. Once the race begins, an annoucer calls it over the loud speaker. Afer the race, some of the jockeys stick around to let people look at their horses. It’s pretty cool for the kids and people like me who like the animals. I didn’t get a good photo of it, but before the race, they have paddocks open to the public so you can get a good look at the horses. 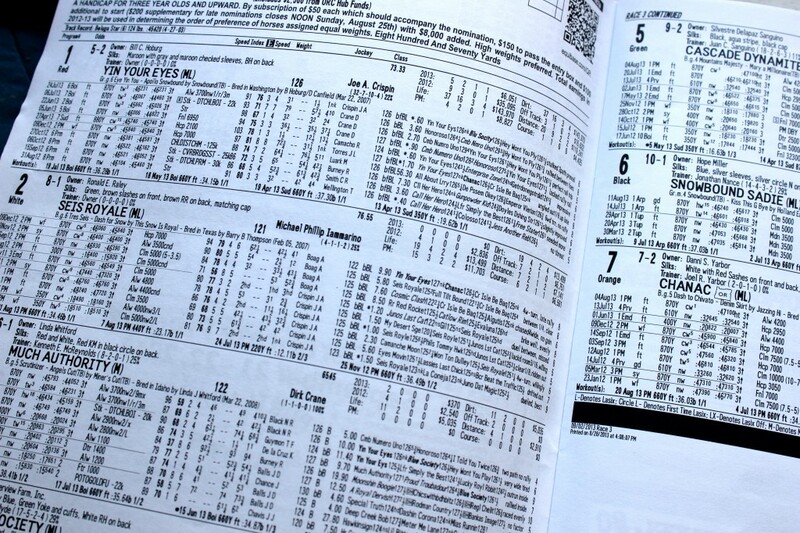 I don’t know much about the animals, but I suppose it might help you make your decision on who to bet on. Overall, it’s a great way to spend a Sunday afternoon, and it’s surprisingly affordable (depending on how you bet, or course). 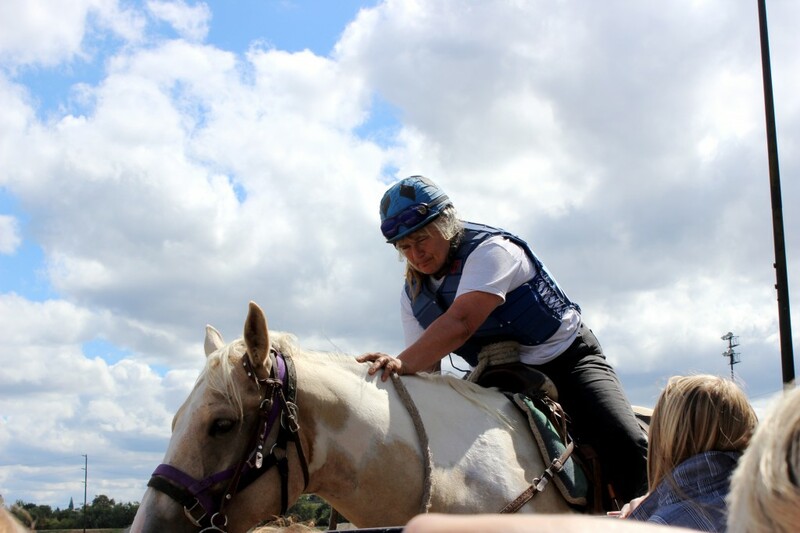 I was only able to stick around for a few races, but I had a great time and left wishing I could stay longer. But luckily live racing continues every Sunday from now through December so we all have plenty of chances to stop by and bet on a few ponies.